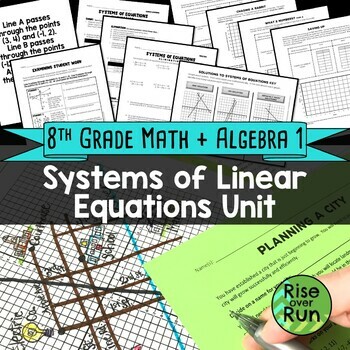 This Systems Bundle includes resources for teaching an entire unit.The resources are a variety that I have created while teaching 8th grade math and Algebra I. They are not meant to be a complete curriculum, but the bundle will definitely give you plenty of material to use throughout your systems unit. I hope you find it helpful in teaching your class. These items have been tested by me in my own classroom, as well as many other TPT'ers! Check out my reviews. Please browse the links below to see individual resources included in this bundle. Thank you for your interest in this bundled resource from Rise over Run.